September is National Prostate Cancer Awareness Month. The presidential proclamation noting this included the following statement encouraging “all Americans to lend their support to family, friends, and neighbors whose lives have been touched by prostate cancer. The Taussig Cancer Institute at the Cleveland Clinic in Ohio employs more than 250 highly skilled doctors, nurses, and other healthcare professionals who provide advanced cancer care to more than 14,000 patients with cancer each year. 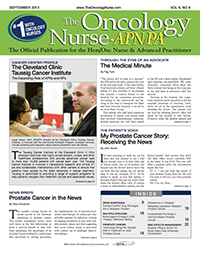 This month’s column focuses on recent reports in the literature pertaining to prostate cancer. “The doctor will be here in a minute,” the RN said to me and a patient who was in the recovery room. A few days before, I had received a phone call from a friend asking if I was available to accompany this woman, a mutual friend, to the hospital for an outpatient procedure. I’d been meaning to wash my car for days, and was pleased to see I had just enough time to fit that little task in before sunset. Just as I’d finished and hopped into the driver’s seat to move the car back into the garage, my cell phone rang. Recent surveys of oncologists and hematologists show that drug shortages persist, that practitioners are adapting in ways that often raise the cost of cancer care, and that most have no guidance to aid in decision making in the face of these shortages. As the second leading cause of cancer-related deaths among men in the United States, prostate cancer is expected to cause approximately 29,720 deaths during 2013. In recognition of National Prostate Cancer Awareness Month, let’s examine these prostate cancer statistics. Advances in the understanding of the biology of multiple myeloma (MM) and the identification of new drugs have resulted in improved management of MM, including patients who are refractory to proteasome inhibitors and immunomodulatory agents. The rate of therapy for localized prostate cancer does not increase in markets with higher penetration of robotic surgical technology and intensity-modulated radiation therapy (IMRT), according to an examination of trends using the Surveillance, Epidemiology and End Results (SEER)-Medicare linked database. Abiraterone plus prednisone reduces the risk of disease progression and delays the time to opiate use and chemotherapy versus prednisone alone in men with metastatic castration-resistant prostate cancer (mCRPC) who had not received chemotherapy for metastatic disease.